A state project taking place on the Longfellow Bridge is rerouting traffic to O’Brien Highway in front of the Museum. At times, increased traffic volume due to this detour may cause delays. Please allow extra time or consider taking public transportation. Take I-95 North to Massachusetts exit 12, which will put you on to I-93 North toward Boston. See "Continuation of I-93 Northbound Exit 26 (Storrow Drive)" below. Take Route 3 North until it turns into I-93 North, to Boston. As you proceed on exit 26, stay left for Leverett Circle/28 N.
Continue staying left for 28 N and proceed through the Leverett traffic lights and onto 28 N, the O'Brien Highway. The Museum is on your left. The parking garage is at the far end of the building. Take I-93 South to Exit 26 (Storrow Dr./North Station). Follow signs for Leverett Circle/28 North. Take a left after the light towards Cambridge. At the next light, turn right onto the O'Brien Highway, Route 28 North. The Museum will be on your left. The parking garage is at the far end of the building. Take I-95 South to Exit 46. Follow Route 1 South directions below. Take Rt 1 South over the Tobin Bridge ($3 for cars). Follow signs to Storrow Dr/North Station and then North Station/Leverett Circle/28N. At the end of the ramp, take a left after the traffic light towards Cambridge. At the next light, turn right onto the O'Brien Highway (Route 28 North). Take Route 1A South through the Sumner Tunnel ($3.50 for cars). Stay right for the connector tunnel labeled Storrow Drive. Look for signs for Leverett Circle/28 North. Stay left for 28 North and proceed through the Leverett traffic lights and onto 28 North, the O'Brien Highway. Take Mass Pike I-90 East to I-93 North. Take Exit 26 off of I-93 North (Storrow Drive). As you proceed on exit 26, stay left for Leverett Circle/28 North. Continue staying left for 28 North and proceed through the Leverett traffic lights and onto 28 North, the O'Brien Highway. Take Mass Pike I-90 East to exit 18 (Allston/Cambridge). After the toll booth ($1.00 for cars) take ramp to right. Take a right at traffic light after crossing bridge over the Charles River to Memorial Drive East/Route 3 South. Follow Memorial Drive straight to Land Boulevard. At the traffic light after the Sonesta Hotel, take a right onto Route 28 South; O'Brien Highway. The Museum is immediately on the right. Take Route 2 East to Memorial Drive. Follow Memorial Drive straight to Land Blvd. At the traffic light after the Sonesta Hotel, take a right onto Route 28 South; O'Brien Highway. Take Mass Pike I-90 East to exit 18 (Allston/Cambridge). After the toll booth ($1.00 for cars) take ramp to the right. At the second light, turn right onto Storrow Drive East. Approaching Leverett Circle, look for signs to Rt 28N and Museum. Take left at Leverett traffic light onto Rt 28N O'Brien Highway. The Museum is on the left. The Museum garage opens at 5:30 a.m. every day. It is open until 11:00 p.m. Sunday – Thursday and 12:00 a.m. Friday – Saturday. On busy days, i.e. weekends and vacation periods, the garage may fill to capacity. Allow extra time to get to the Museum before your visit. Please note alternate parking options. We recommend arriving early (before 10:30 a.m.) or late (after 3:00 p.m.) for best parking availability. The Museum is located near the heart of Boston, and city traffic can cause backup as cars exit the garage. We appreciate your patience. Bring your ticket with you for payment at automated kiosks (debit and credit card only) inside. Getting to and from the Museum — and the rest of the city — just got easier, and more fun! 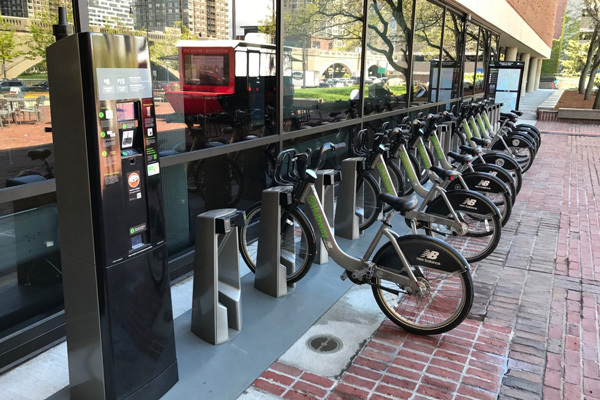 Blue Bikes, metro Boston’s bicycle-sharing system, is now available on the front plaza of the Museum near the front entrance. Blue Bikes is a regional partnership between Boston, Brookline, Cambridge, and Somerville. For more information: bluebikes.com. The Museum of Science is committed to environmental sustainability. Take the MBTA's Green Line subway to Science Park station. This will be the Green Line's Lechmere-bound "E" train. The Museum is diagonally across the street (O'Brien Highway), just over the Charles River Dam draw bridge. The Green Line or Orange Line to North Station. Then, follow Nashua Street to O'Brien Highway and turn right toward the Museum. The Red Line to Charles/MGH Station. Then, cross Storrow Drive toward the Charles River and turn right, walking with the river to your left. Turn left at the Charles River Dam and State Police Station onto O'Brien Highway. The Museum is on your left. The Orange Line to Bunker Hill Community College Station. Then, walk over the Gilmore Bridge. At the next traffic light (O'Brien Highway) turn left and cross the street to the Museum. The MBTA Commuter Rail train from the north makes its final stop at North Station (Green Line and Orange Line). The Amtrak Train from the south stops at Back Bay Station (Orange Line) and South Station (Red Line). Logan Airport has a Blue Line stop called Airport Station. Shuttle buses run from the airport terminals to the station. The Silver Line also connects airport terminals to South Station (Red Line). For inquiries or assistance, call 617-723-2500. For more information about public transportation, please visit the MBTA's MBTA's web site.